Princess Diana discovers her full powers and true destiny! Sensational 10-inch tall Wonder Woman action figure. Featuring a life-like appearance of actress Gal Gadot! With a wide range of motion, she comes with her sword and shield. 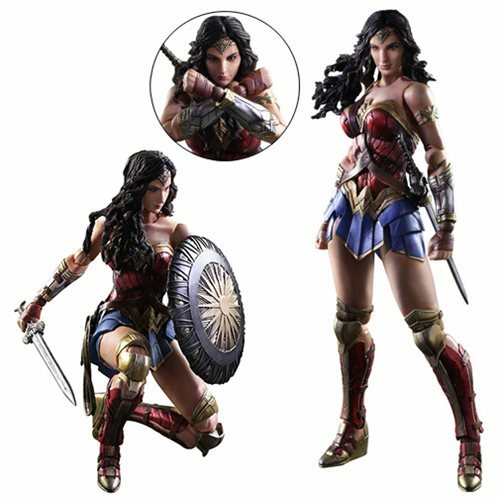 The heroine of the Wonder Woman movie is now a Play Arts Kai action figure! The overall balance of this Wonder Woman Movie Play Arts Kai Action Figure belies her strength in its graceful appearance. The details in everything from her expression and hair to her weapon are incorporated in an updated sculpt design, and the textures and contrast generated by the highlights and shadows in the paintwork give a life-like appearance of actress Gal Gadot. With its soft materials, the figure has a wide range of motion, and it comes with a variety of accessories that include her sword (which can be mounted to her waist or shoulder) and her shield (carefully recreated as seen in the movie). The high quality of this action figure makes it a true masterpiece! Wonder Woman measures 10-inches tall, includes a display stand, and is packaged in a window box. Ages 15 and up. Before she was Wonder Woman, she was Diana, princess of the Amazons, raised on a sheltered island paradise and trained to be an unconquerable warrior. When an American pilot crashes on the shore and tells of a massive conflict raging in the outside world, Diana leaves her home, convinced that she can stop the threat. Fighting alongside Man in a war to end all wars, Princess Diana of Themyscira discovers her full powers... and her true destiny.